The speed of propagation c can be the speed of sound *or* the speed of light and radio waves. Sound waves are waves which propagate vibrations of air molecules. has to be used as speed of propagation, the following conversions apply. Fill out the gray box above and click on the calculation button of the respective column. The proposed speed of sound c = 343 m/s or 1125.33 ft/s can be changed here. The 1986 established value is c = 331.3 m/s at a temperature of ϑ = 0° Celsius. first time. Toggle between the changed values. Do a "refresh" and try again. c is the speed of light waves and the speed of radio waves in a vacuum. electromagnetic waves propagate, including light waves. The proposed speed of light c = 299 792 458 m/s or 983 571 056 ft/s can be changed here. the speed of light, that is ≈ 270,000 km/s. the speed of light, that is ≈ 200,000 km/s. In theory electrical signals move at the speed of light. Cables only slow them down. Sound is also shown at the spectrum chart, but it is no electromagnetic radiation. 1 Å = 10−10 m = 0.1 nm angegeben. The notation "eV" stands for electron-volts, a common unit of energy measure in atomic physics. Thus we see that visible light and gamma rays and microwaves are really the same. They are all electromagnetic radiation and they just differ in their wavelengths. Sometimes the unit Ångström (angstrom) = 10−10 m = 0.1 nm is used for wavelength. 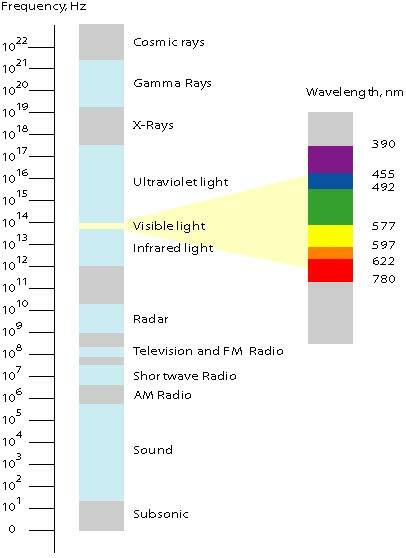 1 nm = 10−3 μm = 10−6 mm = 10−9 m.
White light is a mixture of the colors of the visible spectra. The indication of the frequency is less common in the optics. ● Electromagnetic waves need no transport medium. ● Sound waves or acoustic waves need necessarily a transport medium.